aslibra.com. 33024 IN NS k8.hkidc.com. aslibra.com. 33024 IN NS b.hkidc.com. aslibra.com. 33024 IN NS j6.hkidc.com. aslibra.com. 33024 IN NS ns8.hkidc.com. aslibra.com. 33024 IN NS ns5.hkidc.com. aslibra.com. 33024 IN NS a.hkidc.com. www.163.com. 51561 IN CNAME www.cache.gslb.netease.com. gslb.netease.com. 1604 IN NS gslb1.netease.com. gslb.netease.com. 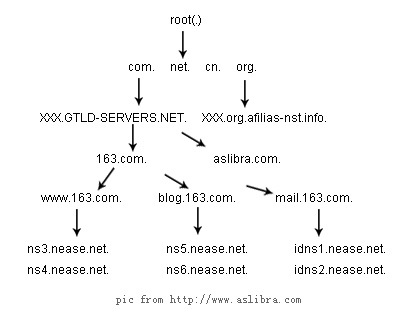 1604 IN NS gslb2.netease.com.
. 223628 IN NS e.root-servers.net.
. 223628 IN NS f.root-servers.net.
. 223628 IN NS g.root-servers.net.
. 223628 IN NS h.root-servers.net.
. 223628 IN NS i.root-servers.net.
. 223628 IN NS j.root-servers.net.
. 223628 IN NS k.root-servers.net.
. 223628 IN NS l.root-servers.net.
. 223628 IN NS m.root-servers.net.
. 223628 IN NS a.root-servers.net.
. 223628 IN NS b.root-servers.net.
. 223628 IN NS c.root-servers.net.
. 223628 IN NS d.root-servers.net. 163.com. 172800 IN NS ns3.nease.net. 163.com. 172800 IN NS ns4.nease.net. www.163.com. 86400 IN CNAME www.cache.gslb.netease.com. gslb.netease.com. 18000 IN NS gslb1.netease.com. gslb.netease.com. 18000 IN NS gslb2.netease.com. .com .cn .net各种域名都从这里开始分配授权，比如 .com 授权给 (A-G).GTLD-SERVERS.NET. netease.com. 172800 IN NS ns3.nease.net. netease.com. 172800 IN NS ns4.nease.net. gslb.netease.com. 1800 IN NS gslb2.netease.com. gslb.netease.com. 1800 IN NS gslb1.netease.com. 看了这个文章, 有点懂了. 不过不知道这样的情况, 解析过程是如何的?两个分属于不同管理机构的域名: a.net 和 a.org分别注册了DNS服务器: ns.a.net 和 ns.a.org而我设置a.net 的DNS服务器为: ns.a.orga.org 的DNS服务器设置为: ns.a.net那整个解析过程是怎么样的? ns.a.net 这个DNS地址的IP地址,是谁负责告诉给客户端的?